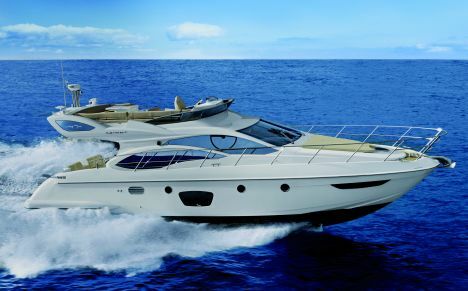 Positioned in the medium-sized range of yachts, the Azimut 47 features modern lines and interesting solutions belowdecks. 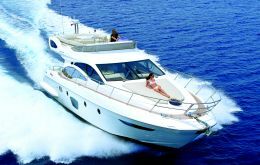 The Azimut yard increases its already ample range of flying bridge models with this 47', a yacht that gets admired for her simplicity and elegance. 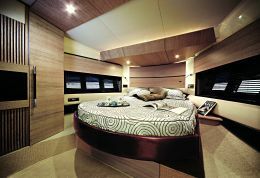 Esthetical solutions, aiming to a slender outline and to functional conceptions, represent the strength of this new yacht. First of all, the characteristic butterfly-shaped ample side windows that with their large opening panes allow abundant natural light inside. 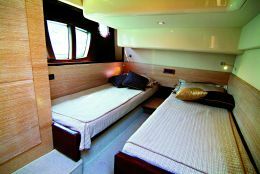 Moreover, the portholes in every cabin contribute to the pleasant sensation of the visual contact with the surrounding marine environment. Sea trials were carried out with calm sea, yet we have been able to confirm the hull's seakeeping abilities. Considering the type of boat she demonstrated to be stable and performing. Interiors are well laid out, with three separate double cabins, a capacious food store and a large saloon communicating with the cockpit. We were favorably impressed by the food store, in the lower deck amidships, lighted by the ample windshield above. 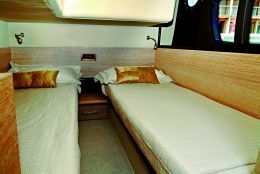 As mentioned in the beginning of the article, the cabins are unusually bright thanks to the unusual shape of the portholes (even though they are portholes we believe this term is reductive) and feature some very practical solutions, such as the large locker/closet under the mattress of the bow cabin or the starboard cabin's sliding bed which may become a double bed in case of need. 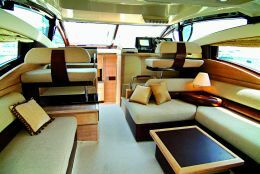 Even the saloon offers interesting solutions, with several convivial spaces for guests and a small table, specular to the control station, is ideal for course-plotting. 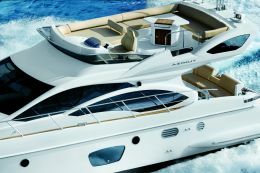 The Azimut 47 occupies a place in a market sector which is already very crowded by yachts of competing yards, nevertheless, given her excellent credentials and design solutions, we believe she will be able to enjoy the approval of an exacting and selected clientele. 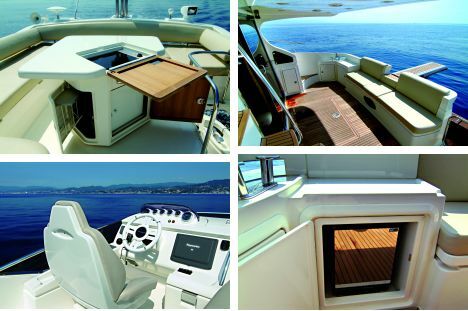 Price with standard equipment and test boat power: Euro 650,000.00 + VAT. 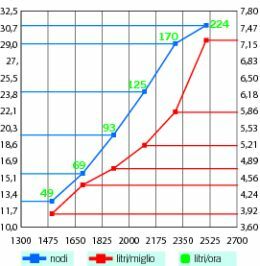 Fuel consumption indicated in the graph is obtained from engine consumption curves supplied by the manufacturer, nevertheless the effective consumption at sea may differ from published data as a function of: loads and their distribution aboard, vessel conditions, engine state and adjustment as well as characteristics of propellers used. Aft platform: teak platform, with 2 side lights; stainless steel stowaway swimming ladder; steel cockpit access door. 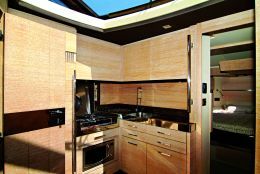 Galley: natural lighting from the top through the ample windows (from windshield). Three ceramic hobs with stainless steel pot holders; microwave oven; worktop with sink; hot and cold water mixing tap; extractor hood; 190 liter refrigerator. 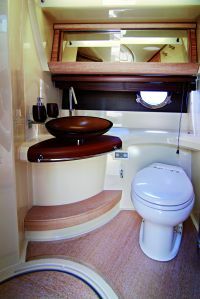 Optional fittings: deckhand cabin; air conditioning and ventilation system; fire-fighting/deck washing system with sea water with 6 m long hose and spray nozzle; two waterproof recessed led lights; bimini-top on flybridge; dishwasher; icemaker; teak sidedecks, cockpit and aft platform. 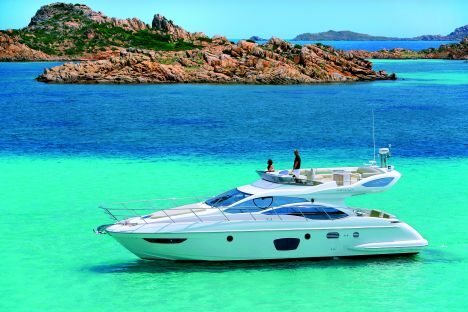 Maximum speed at 2,500 rpm's: 31 knots. 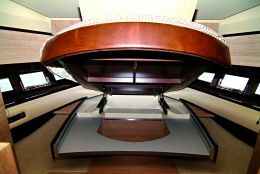 Docking maneuverability: good response and reliable control at low rpm's. 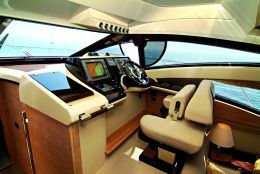 Electric switchboard and plants: in line with the quality of the yacht; highly reliable switches.